Start your engines, motor fans, and get ready for Discovery’s first-ever Motor Mega Week! DStv channel 121 will run a week-long automotive celebration featuring three all-new series premieres – Street Outlaws: No Prep Kings; Twin Turbos; and Shifting Gears With Aaron Kaufman – as well as a four-part, supersized Street Outlaws Vs. Fast N’ Loud: Build To Mega Race series. All leads to a monumental Mega Race finale, with Kyle Busch taking the helm as race master while top drivers go head-to-head for the largest prize in network history. The week will also include the Street Outlaws: Memphis season finale and a special sneak peek of returning fan favorite, American Chopper. 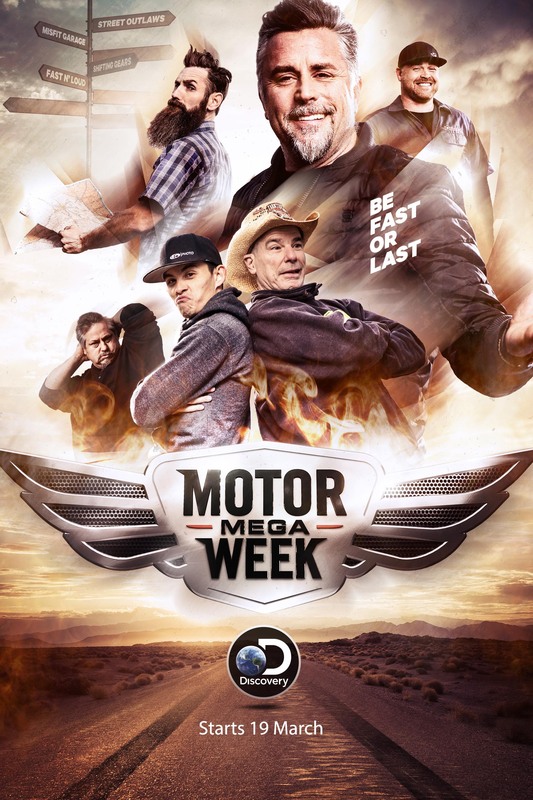 Discovery’s Motor Mega Week begins Monday, 19 March at 18:00 and continues through Sunday, 25 March at 11:05. Discovery’s Motor Mega Weekkicks off with four consecutive nights of epic car builds culminating in a thrilling Mega Race finale as Fast N’ Loud’s Richard Rawlings and his Gas Monkey team take on the 405 crew from Street Outlaws. And for the first time, Misfit Garage’s Tom Smith and Thomas Weeks, alongside their Fired Up Garage team, will duke it out against Street Outlaws’ Farmtruck and AZN. NASCAR Driver Kyle Busch joins the Gas Monkey and 405 crews on the track to serve as race master and make sure neither team bends the rules, as they compete for the largest cash prize in network history. Motor Mega Weekrevs up with Builds And Race Vs. Fast N’ Loud: Build To Mega Race Part Oneat 18:00 on Monday, 19 March followed by Shifting Gears With Aaron Kaufman at 19:00. This is the first installment of the four-part Build To Mega Race series, which takes viewers inside the garages of some of the network’s top motor talent as they prep for the epic showdown Mega Race. Build To Mega Race continues with Part Two on Tuesday, 20 March at 18:00, before the 19:00 premiere of Twin Turbos: Building A Future which follows father-son duo Doug and Brad DeBerti as they push the boundaries on custom builds, creating outrageous, state-of-the-art vehicles like a truck modeled after a fighter jet, and developing the first ever drift racing truck. Wednesday, 21 March gets going with the third part of Build To Mega Race airing at 18:00. The long-awaited American Chopper debuts an exclusive sneak peek of its upcoming season at 19:00, with world-class motorcycle builders Paul Teutul, Sr. and Paul Teutul, Jr. returning to reclaim their place atop the high-pressure world of customized bike building. With clients including A-list celebrities, world famous athletes, and Forbes 100 businesses, millions of dollars and their brands’ reputations are on the line with each signature build. On Thursday, 22 March the crews from Gas Monkey Garage, the 405 and Fired Up Garage wrap up their builds for the final Build To Mega Race episode at 18:00. On Friday, 23 March the new season of Street Outlaws premieres at 21:00. In this all new series, Outlaw veteran Chuck serves as race master in a new city on a new “no prep” track every week, with racers duking it out to become the ultimate no prep winner. The stakes are high and the excitement is higher as local crowds flood in to see which all-star Street Outlaw will show up to win it all. Street Outlaws, Fast N’ Loud, American Chopper, Shifting Gears With Aaron Kaufman, the four-part “build” series and the Mega Race finale are all produced by Craig Piligian’s Pilgrim Media Group. Twin Turbos is produced by Half Yard Productions.